The style is hardly new. The New American Garden has been around since the 1960s, when Wolfgang Oehme and James van Sweden began replacing lawns with swaths of ornamental grasses and perennials. It is still anything but outdated. 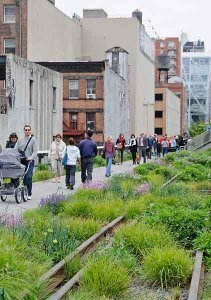 Piet Oudolf’s High Line in New York and Lurie Park in Chicago have popularized the style in recent years. It’s not surprising that a style of gardening that was sustainable and ecological before sustainability was talked about is still in the spotlight due to its heavy use of plants attractive to pollinators and wildlife. Ornamental grasses, coneflowers, black-eyed Susans, Persicaria, Veronicastrum – we know these fit in the style in summer and fall. But what do you plant for spring? While summer-blooming plants are slowly coming up in spring, early blooming perennials can give your planting color and interest. 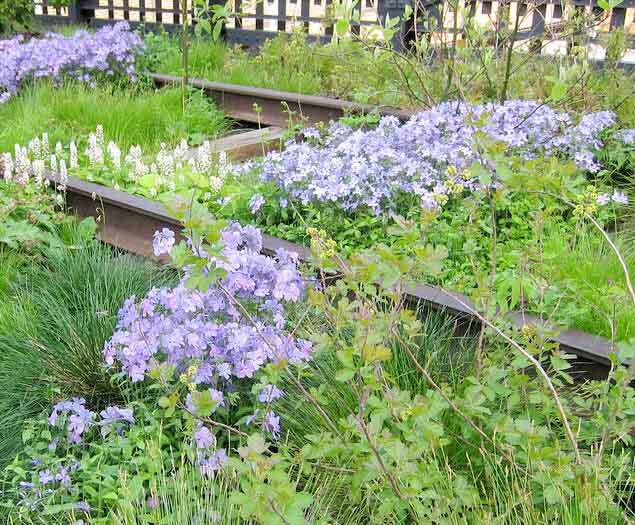 As summer fills out, taller late-blooming perennials will hide the spring remnants. Here are a few ideas to try for spring blooms. Bergenia cordifolia ‘Winterglow’: This is a low growing evergreen perennial that makes a great groundcover with large, waxy leaves that turn red during the winter. In early spring, ruby pink flowers bloom on stalks above the foliage. Look for it at nurseries in early spring or you might miss it. Plant in part sun to shade. 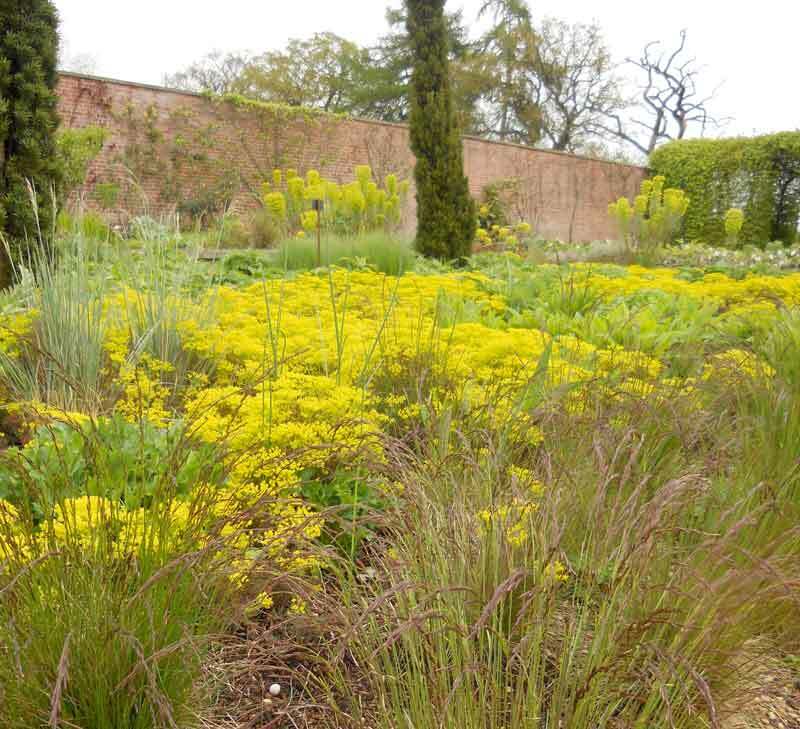 Cushion Spurge (Euphorbia polychroma): You’ll get bright sun-yellow blooms from this plant in early spring when tulips are blooming. Butterflies love it and it’s a good source of early season nectar. It forms a mounded cushion that can be pruned back in early summer after blooming in order to keep it compact. In fall, leaves turn bright red. Try growing it from seed. Plant in sun to part sun. Snowbell (Leucojum aestivum): Snowbells aren’t too common in North Carolina, but they grow well here and can be bought from mail order nurseries. Over time they’ll naturalize, blooming into a sea of white in early spring around the same time as the crocus. Plant them around the base of your perennials with other early bulbs and you’ll have a show to dispel your late-winter blues while you’re waiting for spring. Plant in sun to shade. Peony (Paeonia sp. ): Have you ever seen peonies naturalized in a meadow? Peonies are gorgeous in the spring, not so much in the summer especially here in the South. Why not plant them amongst ornamental grasses and late summer perennials and let these cover up the peony leaves after the blooms are gone? Plant in sun to part sun. Woodland Phlox (Phlox divaricata): This is a great plant to use under deciduous shrubs that are late to leaf out. Woodland phlox is a native groundcover with playful blue-purple blooms in spring. If it’s grown in more sun, it may go dormant in the summer. It’s worth trying at the base of taller perennials and grasses that may provide some dappled shade in summer. Look for it at your local nursery in spring. Plant in part sun to shade.